As a freshman/sophomore in college and environmental science major, I always kept plants in my dorm room. I admired my lab partner Dustin’s super green dorm room that overflowed with plants. He gave me several “spider plant babies”, which I kept in the tiniest of pots. Plastic cups. Those plastic lids from empty CD dispensers. I loved keeping these guys alive on my window sill. I loved anything alive in my dorm room, which is why I ended up with several tanks of betas, rescued an aquarium of deformed guppies, and even brought Mudd the hamster into the picture (though he was evicted after three months by a lamo RA). After changing my major and moving out of the dorms and into a real house, I lost all of the fish to age or accident, and Mudd escaped to live wildly in the walls. The plants stayed around until I adopted Bogie the cat, who will eat anything grassy and green. I tried putting plants on top of the refrigerator, but they died without access to sufficient light. In my next house, I kept a fern in the empty fireplace (where it was chewed on a lot before it died), and a few plants on hooks on the porch outside (which got too cold and died). I tried to keep “fridge plants” again in Flagstaff, but, again, they died. Plants on hooks on our Georgia porch didn’t work out too well either (they burnt out before the winter, when they… you know). I missed plants around the house, but between school, cross-country moves, and a crazy cat, they weren’t a priority. I couldn’t justify keeping them around, and the constant cycle of death depressed me. Last May, Tammy gave me a few day lily bulbs to get me started again. Day lilies are toxic to cats, so I had no choice but to buy a few pots and start gardening outside. The day lilies were a low-maintenance starter plant for me. They were doing well enough that I went to an iris fair and picked up a few iris bulbs in October. I was horrified that the plants wouldn’t survive our January move from GA to NC, but three day lily pots and one iris pot made it. Now they’re thriving in our full-sun front yard. My day lilies and iris are almost twice the size that they were pre-NC move. I also have started pots with black-eyed susans, marigolds, forget me nots, butterfly weed. I’ve read several gardening books and watched several gardening documentaries in the last month. 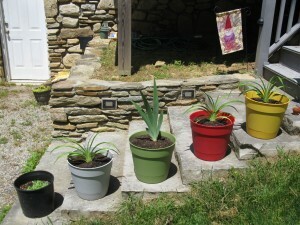 Yesterday I tried to transplant a few irises from yard to pots. My main birthday celebration will be attending the Hendersonville Garden Jubilee over Memorial Day weekend. Derrick finds my newfound gardening interest a little strange and he is uninterested in checking out my plants most of the time. That’s okay with me. But I don’t even see this as something newfound. I have been able to reconnect to something that was very important to me before Derrick, before the cat, before the poetry workshops and the teaching. I feel like I’m getting back to something that is a part of my core as a human being. I’ve told Derrick that my Garden Jubilee goal is to find a spider plant. Now that I’ve got the time, space, and green thumb, I wonder if I could grow a spider plant as big as the ones I remember and admire.